Looking for a private experience? Contact us with what you are looking for. 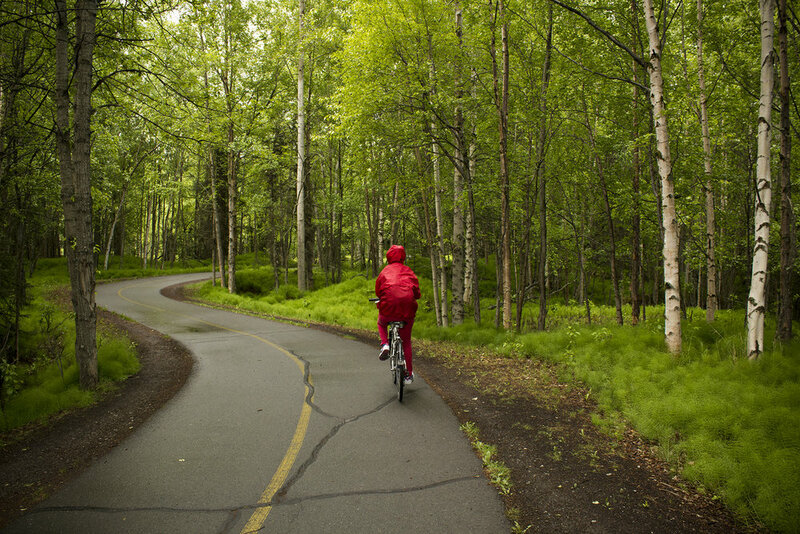 Anchorage boasts 150 miles of paved, multi-use forested trails through town. This tour aims to show you the best of what Anchorage has to offer. There are plenty of stops, stories and photo ops along the way. Cycle through Kincaid Park, Anchorages largest park with the densest population of moose in the city. Visit Earthquake Park, a memorial for the 2nd largest earthquake in history that caused mass destruction in Anchorage, and Alaska, in 1964. The entire ride is along the coast, with views of 5 different mountain ranges including the Alaska Range and Denali. Next stop, Resolution Brewing Company! With a name inspired by one of Captain James Cook's ships, this brewery is a must on the list of places to visit in Anchorage. At Resolution Brewing Company they are as much about the craft beer as the recipe and process to brew it. Like what you taste? Speak with the brewer's and learn about their recipe's. Owned and operated by local Alaskan's, this brewery embodies the community is which it exists. We require that riders know how to ride a bike and are comfortable shifting gears and using hand brakes. Please see the skill / fitness level tab, riders are required to have a minimum skill level of 2 and fitness level of 3. This trip is for rider who are looking for a relaxed way to see and experience Anchorage. There are numerous stops along the way where your guide will share interpretative ecology and natural history. For some of our guests it may have been awhile since they've ridden a bike. Our guides are here to help you become familiar again with the equipment and make sure you're ready to enjoy the ride. If at any point your are too tired and no longer want to ride, join our driver guide in our vehicle. At every stop you will be able to get out and enjoy the scenery and take pictures. Riding Distance: 5 - 9.5 miles, depending on your riding level. The vehicle meets the group at several designated areas along the route. Riders have the option of continuing in the vehicle with the driver guide. Minimum height: 4’7”, minimum 11 years old, no maximum age as long as participants are comfortable with the trip fitness requirements. You must be 21 years or older to visit the distillery. What AKTG provides: Bike: Bike: Kona hybrid bike. This bike has an aluminum frame to save weight and is built for a lifetime of miles and comfort. This bike is designed for commuting and leisurely adventure. Or a Specialized Roll step through bike designed for comfort and hassle free experience.